Jokes About Rob Ford's Death Are In Poor Taste & Nothing About His Last Years Were "Funny"
Former Toronto Mayor Rob Ford died Tuesday morning following a battle with cancer. The 46-year-old became well-known around the globe when a he admitted to smoking crack in a "drunken stupor" in 2013 after videos of the incident surfaced, but regardless of why you know his name, you shouldn't joke about Ford's death. There's absolutely nothing funny about someone dying prematurely because of cancer, leaving his family behind — nor is there anything funny about drug addiction. The former politician's family released a statement about his death Tuesday that read: "With heavy hearts and profound sadness, the Ford family announces the passing of their beloved son, brother, husband, and father, Councillor Rob Ford, earlier today at the age of 46. 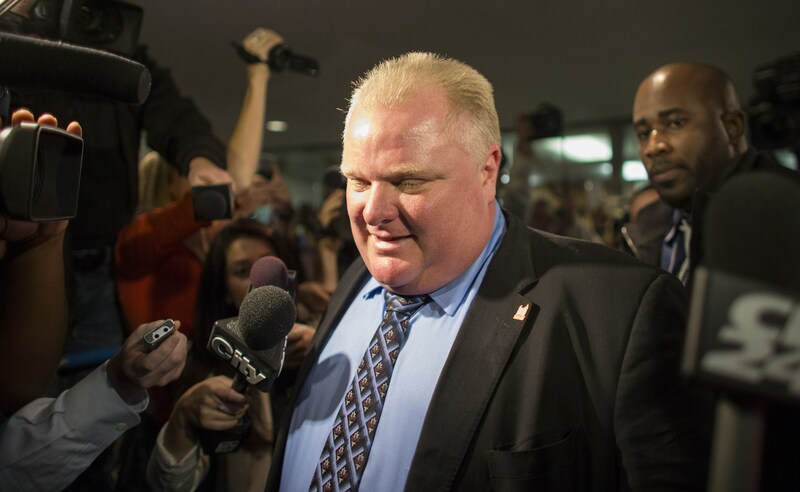 A dedicated man of the people, Councillor Ford spent his life serving the citizens of Toronto." Ford had a rare form of cancer, pleomorphic liposarcoma, that was discovered when he went to the hospital with severe stomach pains in 2014. He underwent surgery and chemotherapy to remove tumors in multiple parts of his body before his condition worsened and he passed away at Mount Sinai Hospital in Toronto. He was survived by his wife, Renata, and their two children. After the drug scandal, the mayor entered a rehabilitation program for addiction in the summer of 2014. He suspended his race for re-election as mayor the same year after the cancer diagnosis, opting to return to his previous city council seat. Although you may be tempted to crack a seemingly witty joke about Ford's death because of his controversial past, you should utilize a little self-control and refrain from posting an insensitive tweet or post. Cancer and drug addiction are terrible no matter who they happens to, especially when one takes a fairly young life. It's extremely tactless to poke fun at the loss of a life that suffered. If you're still feeling inclined to make light of Ford's death, think about his family — the last thing they need after losing a loved one is to read or hear cruel jokes about his life from complete strangers. Cancer and drug addiction are both diseases that cause a lot of physical and emotional pain for the person inflicted and everyone around them, and laughing about it would only add to the misery. Ford deserves to have his life remembered and celebrated just like anyone else, and his family and friends deserve time to grieve their loss.